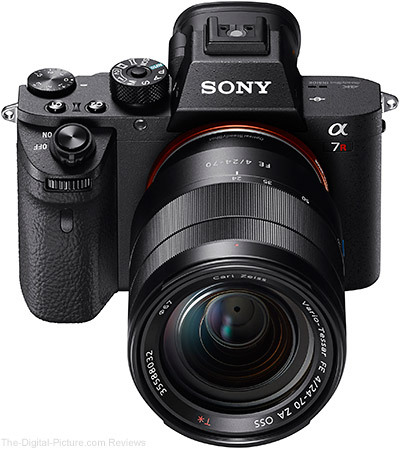 Thanks to popular request, I have added a Sony Alpha a7R II to my kit and, as time permits, intend to bring you a full review of this camera and many of the lenses made for it. This page will be continuously updated as I familiarize myself with this camera. Note that this review will not exactly follow the site's current standard camera review format and I will share many Sony system nuances and introductory information. And, I may relate information to the Canon system as well. Evaluating image quality is always a high priority for a camera review and I took a deep dive into this aspect upon purchasing the a7R II. As with all other test images captured for this site, the a7R II test images are captured in (very highly recommended) RAW format. More specifically for this camera model, "Uncompressed" (non-lossy) RAW format. Processing RAW images is of course a requirement when shooting in RAW format and that means the "Which RAW processing software?" question must, at least initially, be asked and answered. Capturing a high quality RAW image is extremely important, but the processing done to that image is also very important. There are a variety of RAW conversion programs available. I am a big fan of Canon's Digital Photo Professional, but obviously, this manufacturer-specific software is not going to support Sony RAW images. We use Nikon's View NX software for processing Nikon RAW images and it seemed logical and fair to use Sony's Image Data Converter (IDC), with the Sony-native conversion algorithms utilized for Sony RAW file processing. I find Nikon's software more cumbersome than Canon's DPP and Sony's IDC, at least initially, does not even seem as friendly as Nikon View NX. After spending many hours evaluating IDC v4 and determining the best settings to use for our baseline test image processing, we downloaded and installed the latest version of IDC on our lab computer. Strange was that the results coming from it were not identical to those I had been working on. That was when I learned that ISC v5 had recently been released and the not-much-older download was v4. One of the updates touted for v5 was improved image quality and that sent me back to the starting point in this decision. The first issue encountered while lab testing the Sony a7R II was that it does not deliver a neutral auto white balance in images of our black and white test chart lit by Sony flashes (Nikon also does not, Canon does). That means a custom white balance must be selected in the RAW processing software and one of the first things I learned about IDC version 5.0's custom white balance feature is that it does not produce neutral colors, instead producing magenta-toned results. This appears to be a software bug and the issue will likely be fixed up at some point, but for now, the resolution test chart results shown below have been further corrected in Photoshop. Regardless of the custom white balance issue, I was still not convinced that we should base all further Sony camera and lens tests on the IDC results. Sony also advertises Capture One Express (for Sony) being available. This version is free, but expect the upsell throughout the download and installation. Another wildly popular RAW conversion engine is Adobe Camera Raw, utilized by Lightroom and Photoshop. It only seemed fitting to take another look at this option. With all quality RAW conversion software having the ability to significantly change how an image looks and all RAW files having potentially the same opportunities for software enhancement, I like to dig down close to the unprocessed RAW file quality. And, at this point, the baseline standard that all further Sony image quality testing will be based on must be established. For processing into the site's Image Quality Comparison tool, a low contrast neutral creative style (or the equivalent) is used. Turning up contrast is an easy way to make an inferior lens appear to be better than it is and we cut no breaks in this regard. Another break we do not cut is in regards to sharpness. Camera and software manufacturers (not just Sony) like to turn up the default sharpness setting because, well, everyone likes a sharp image. However, the strong sharpening is (almost?) cheating and prevents mediocre lenses from showing their true inabilities, making them appear more similar to higher grade options. The problem is that strong sharpness settings are destructive at the pixel level, reducing image quality, especially in the fine details. In addition to reducing fine detail image quality, increasing sharpness makes noise more apparent by giving it sharper, more-apparent edges, especially at high ISO settings. So, we use a low sharpness setting and determining the standard sharpness setting to use for presented Sony (or any other brand) test results was an important early decision to make. To help establish a baseline, a known excellent quality lens, the Canon EF 200mm f/2L IS USM Lens, was mounted to the Sony a7R II and used to photograph our high resolution enhanced ISO 12233 chart. I know, Canon lenses do not natively mount to Sony cameras. The lens was mounted via a FotodioX Pro Fusion Smart AF Adapter. Why choose this adapter over the most-highly regarded Metabones T Smart Adapter? The biggest reason is price – The FotodioX option costs 25% of the Metabones price. The Metabones adapter may offer better AF capabilities for Canon lenses, but I didn't need AF for this testing purpose. There is no glass in these adapters (they are more like an extension tube in this regard) and Lensrentals reported having good success with the FotodioX adapters. 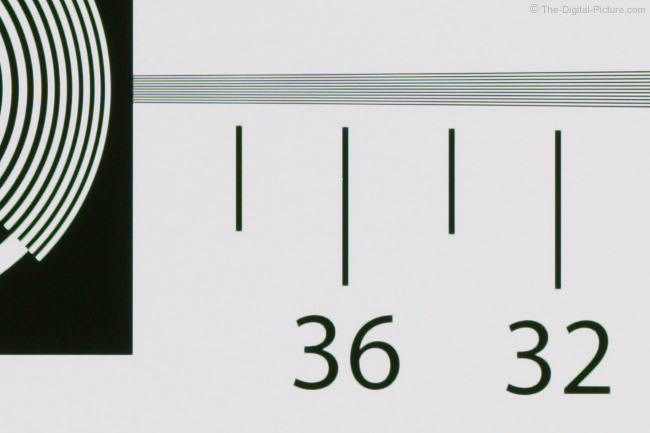 The f/5.6 resolution test results were analyzed to aid in determining the sharpness parameter needed. I find the easiest way to see over-sharpening (I'll call it "fake sharpness") is to look for halos of bright color surrounding sharp lines on an evenly-colored background. Basically, the halos are a row of pixels brighter in color than either of those being transitioned between. Our test chart is pure black and white with a very high resolution transition between the details. This combination makes these halos readily apparent, at least in some of the software options. Another test I like is the color block test. 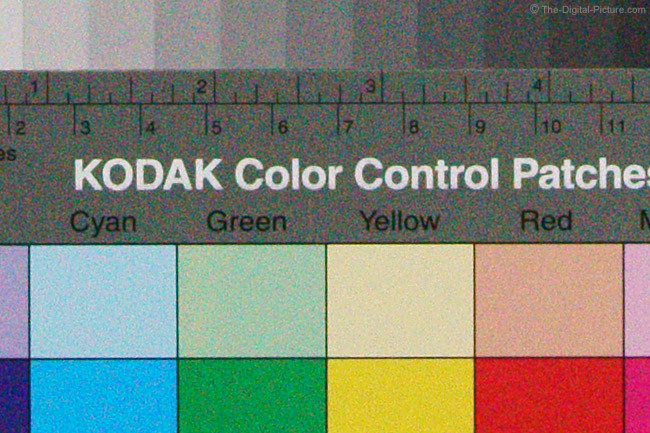 The Kodak Color Control Patches chart has very even colors and is especially good at showing noise. However, the sharp, straight line transitions between the colors also make over-sharpening halos readily apparent. In many cases, the halos were even more apparent in the color blocks than in the ISO 12233 chart. For examples, look for a bright ring around the color blocks in the sharpest ISO 100 results shared further below (especially the light yellow block). While evaluating results from both tests, the goal was to determine the highest amount of sharpening permitted without making these halos visible. This full evaluation was done with each of the three RAW converters mentioned. Let's just say that this task set my schedule back several days. I evaluated 16-bit TIFF files at both 100% and at very high magnification in Photoshop to draw conclusions, but since I did all of the work, I thought I'd share the results with you here. Shown in the comparisons below are 70-quality JPG images created from the TIFF files. The values shown in the rows are the sharpness settings used to process the respective image. One result for each software app has an asterisk preceding the sharpness setting value. This is the result that I determined to be the sharpest yet completely free of sharpening halos. While you cannot view the 16-bit TIFF files at 800 or 1600% here, try zooming your browser's view to dig in a bit (understanding that your browser/computer software will be doing the enlargement manipulation). The Sony IDC software produces the softest results and Capture One produces the sharpest. But, there is false color showing in the Capture One results. Another Capture One issue is that it produced these results very slightly darker than the WYSIWYG preview shows, using the RGB value for the comparison. Above, you like the sharper results best, right? From a noise perspective, you will like the less-sharp results better. The color block images shared next were captured at ISO 100 with the standard creative style (or equivalent) used. While noise at ISO 100 is not strong, there is a difference in results based on the amount of sharpening applied. And, the noise results differ between processing engines. Even more different is the brightness/saturation being applied by software. Next up is the same comparison using an ISO 6400 image. While I can't say that any of the apps are delivering lower noise levels than any of the others, I do see a difference in how that noise appears. The Sony software results appear less-sharp, and the noise is considerably more-blotchy, showing less grain. The Adobe software result is much sharper and shows a fine-but-strong noise grain. The PhaseOne Capture One results are more similar to the Adobe results, with some notable differences. Notice how the difference in brightness/saturation, based on the software's default standard creative style recipe, makes a difference in apparent noise? The Capture One recipe creates a more-muted result with less apparent noise and with a slightly reduced sharpness appearance. Note that there is no noise reduction applied to the above images. Noise reduction is damaging to details and sharpness (though sharpness can be increased with only details often being lost). Do you prefer sharp, detailed images or is a cleaner look with lower noise your preference? You are of course free to adjust your own images to taste and applying at least some level of noise reduction is often a positive choice when high ISO settings are used. Our emphasis here is on comparisons and for the results in the site's tools to be most useful, perhaps the biggest risk at this point is setting the post processing standard sharpening too high as comparisons between lenses become more leveled. And, it is decision time. The Sony IDC software is delivering my least-favorite results in this evaluation and IDC is the first contender to leave the competition. Sony has blessed the PhaseOne Capture One software, I like the tool, I like the results and I wouldn't hesitate moving forward with this choice. I was torn between Capture One's "20" and "40" sharpness settings and, with a hint of halos showing in the resolution chart at the 40 setting, I decided to go with the in between sharpness setting of "30" for the final decision basis. Adobe Camera RAW is also delivering very good results in this comparison, showing less false color in the resolution chart and a more-detailed (though grainier) appearing color block test result compared to Capture One. Even after the comparisons were assembled, I struggled with the final decision for many hours and Sean finally pushed me in the Adobe direction. The plan is to move forward with Sony RAW test images being processed using the Adobe software.